Several years ago I bought a Tiffany Favrile vase that bothered me somewhat. The vase looked contemporary, but the signature was perfect, so I thought my instincts were wrong. I showed it to another dealer who thought the vase was modern, but I still didn’t listen. After all, I’m an expert on Tiffany signatures and this was perfect. Fast forward to today. I now know for a fact the vase was a reproduction. 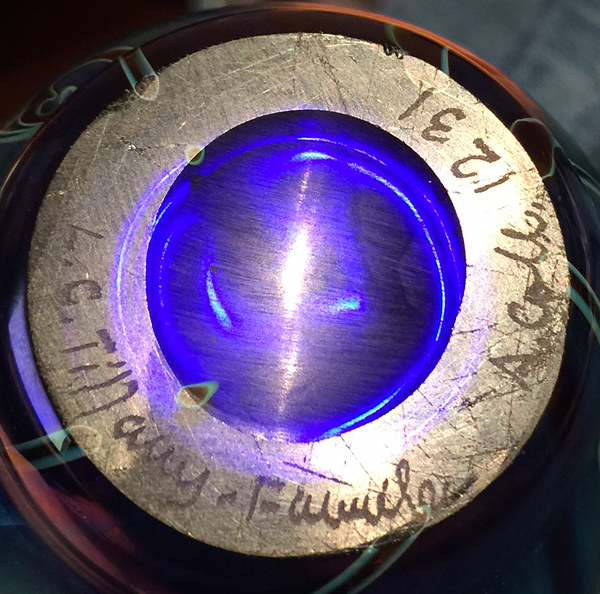 Apparently someone is signing new vases with picture-perfect signatures. It’s like looking at a forged copy of your own signature that’s so good, you’re not sure if you didn’t sign it yourself. Let’s take a good look at the example above. To those who are knowledgeable, the vase is an obvious reproduction. Everything about it is wrong, including the decoration and color, but especially the iridescence. Then look at the signature. It’s perfect, and includes the notation “A. 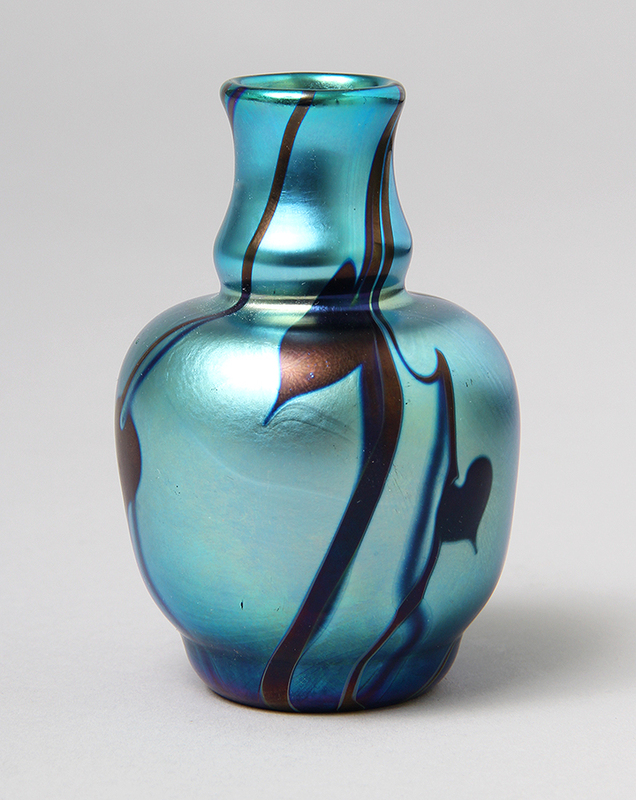 Coll.”, meaning it was in the personal collection of Louis Comfort Tiffany. Poor Louis is so unhappy, he’s turning in his grave. What’s the lesson here? You cannot tell an authentic vase, of any kind, from the signature alone. The shape, the decoration, the workmanship, the wear, the age AND the signature all have to say the same thing — I am authentic. 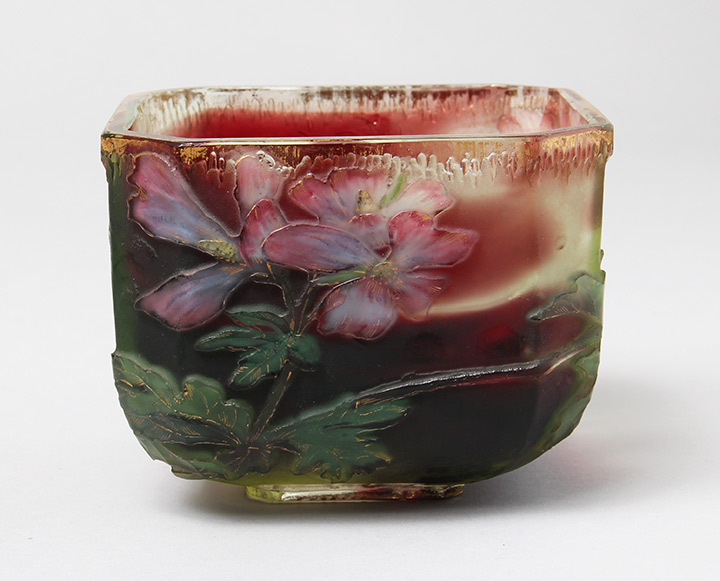 The market in French cameo glass continues to be strong, so I am continually buying and selling. Here are a few of the best items I sold since the beginning of 2016. 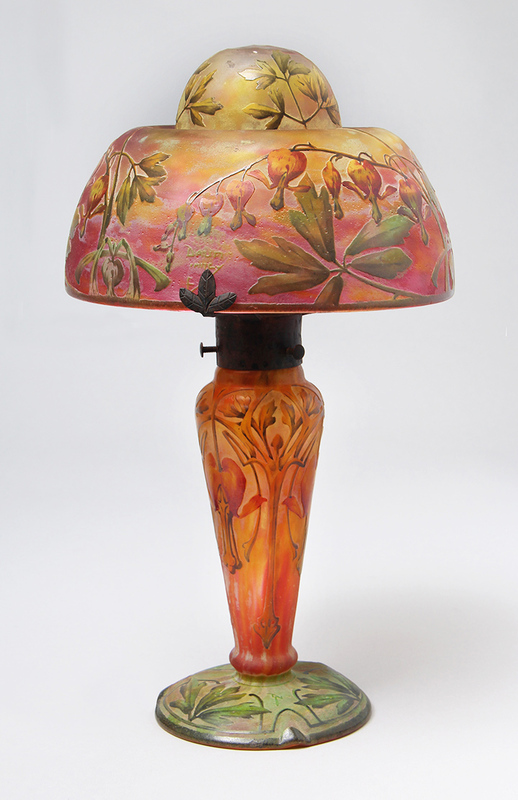 Most Daum lamps are acid-etched only, so any Daum lamp with both acid-etching and enameling is a desirable item. In my experience, floral lamps are rarer than scenic lamps, so when I had the opportunity to purchase this rare, colorful, beautiful Bleeding Hearts lamp, I jumped at it. All Burgun & Schverer (B&S) internally decorated vases are the cat’s meow, but some are more special than others. 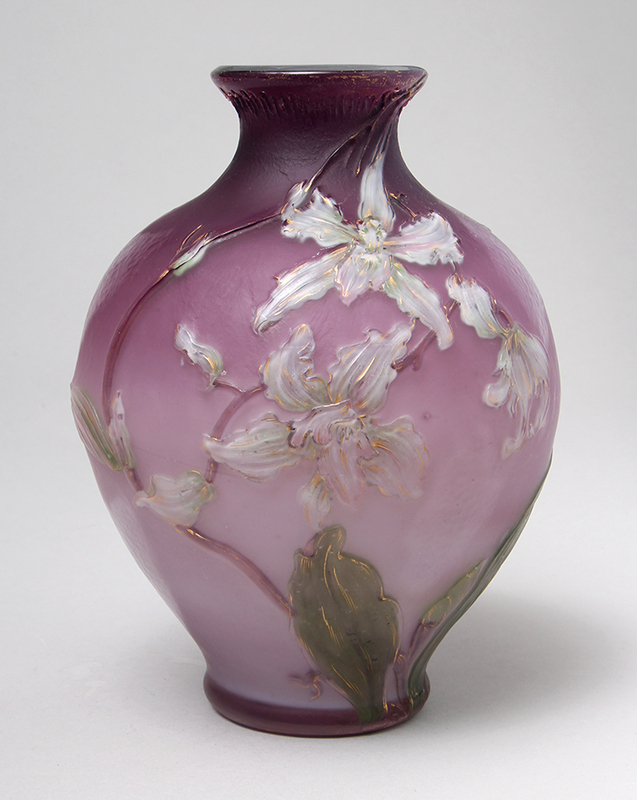 This example, with gorgeous orchids and fine gilded detail, on a lavender-purple background, was one of the best. 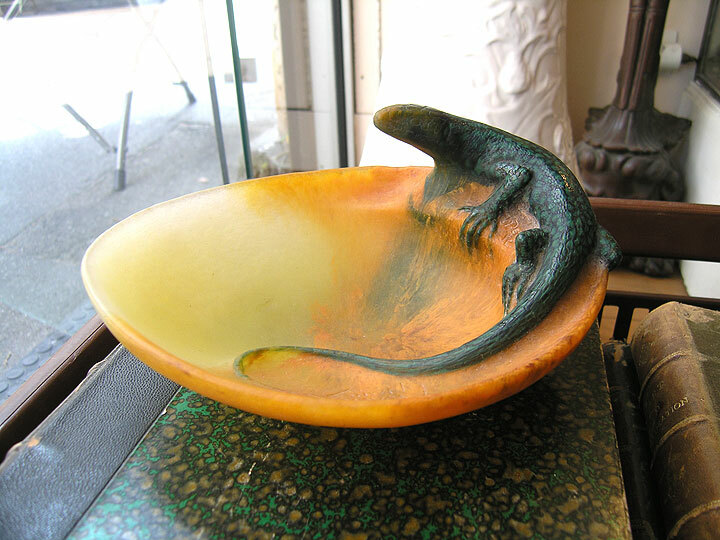 I’ve always been partial to Almaric Walter pâte-de-verre figural objects, especially with lizards or chameleons. This example had beautiful form and color. Swallows are rare subject matter for Daum. This example had extraordinary color and detail, gilded rays of sun, and a beautiful form — all the makings of a special vase! 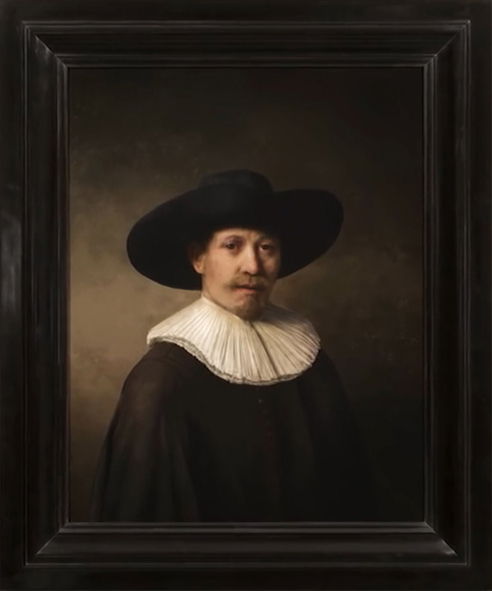 Advances in computer science and 3-D printing have led to the creation of a new painting that Rembrandt could have painted. For the complete story, click here. Then make sure you click here to watch the impressive video. If you read my blog regularly, you know I’m not a fan of preview parties. I still haven’t figured out who gains by having them, but certainly not most of the dealers and specifically not me. I can’t remember the last time I made a sale at any preview party, including this one. At least if I have to suffer through one, let it be like this. The party was classy, with unlimited wine, alcohol and delicious food. 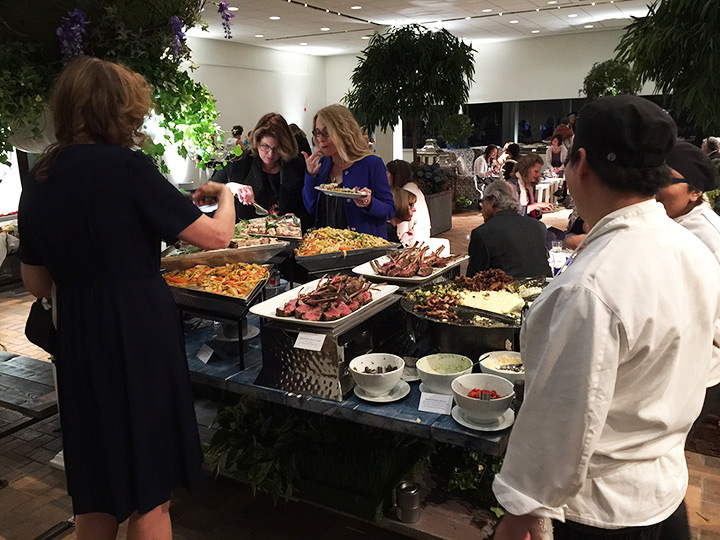 All the dealers and guests were treated the same, unlike some preview parties where the dealers are treated like second-class citizens. Kudos to the planners and the chefs. The show started off strongly with good attendance and good sales on Friday morning. Things slowed down after that, with an occasional sale. Attendance was good on Saturday, but sales were non-existent until one of our loyal, best clients showed up. Sunday was decent with a couple of sales. French glass, and Daum in particular, sold best. Overall our results were off from last year (which was exceptional), partly because our best clients couldn’t attend. 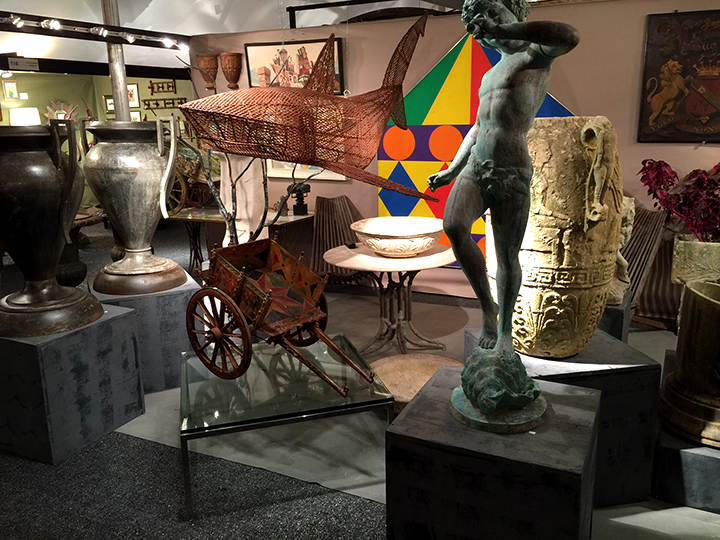 Setup for the Chicago Botanic Garden Antiques and Garden Fair started this past Tuesday, April 12, 2016, and continues today until the preview party tonight. It couldn’t have gone more smoothly. Our booth is large enough that we weren’t stepping all over each other. Now that it’s finished, it looks great. 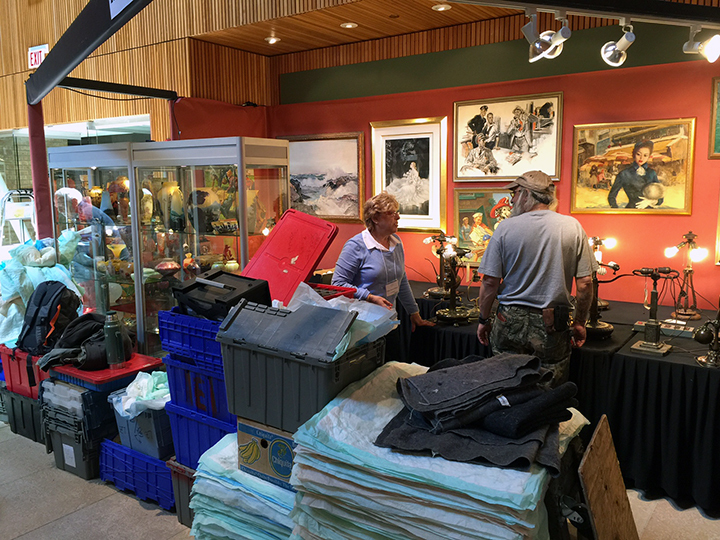 We’re in one of the permanent buildings, while a huge tent has been set up for many of the other antiques dealers. The show is classy, with seriously fine dealers displaying quality merchandise. This is no flea market. The show opens to the public tomorrow, Friday, at 10 AM, and continues until Sunday, at 5 PM. It’s a fun show you’ll be glad you attended, with a great variety of plants, garden items and antiques. The forecast for all three days is sunny, with temperatures in the 50s and 60s. You couldn’t ask for nicer weather for a day at the show. 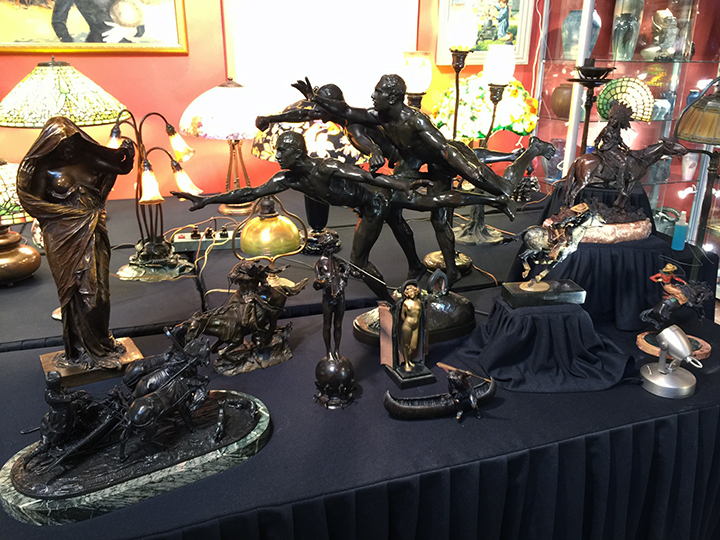 We’re displaying some of our best antiques ever, with great French and American glass and lamps and many more bronzes than we usually have. We’ll have everything for sale at the show, including Daum, Gallé and Tiffany glass; many nice Tiffany lamps, including a rare Nasturtium and lots of other items, too numerous to mention. If you’re in the greater Chicago area, this is one show that’s worth the trip. Please stop in, say hi, and take a look at our great items, all for sale! Make sure you tune in on Monday for the results of the show. 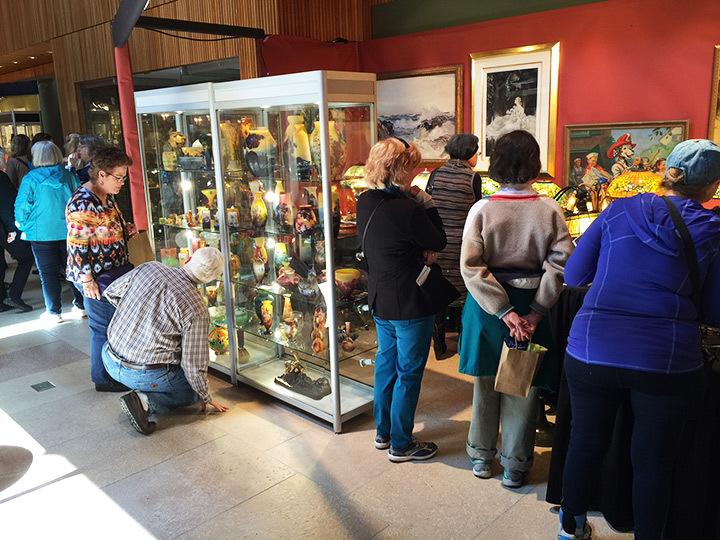 The Chicago Botanic Garden Antiques and Garden Fair in Glencoe opens this Friday, April 15, 2016, at 10 AM, and continues until Sunday, April 17, 2016, at 5 PM. 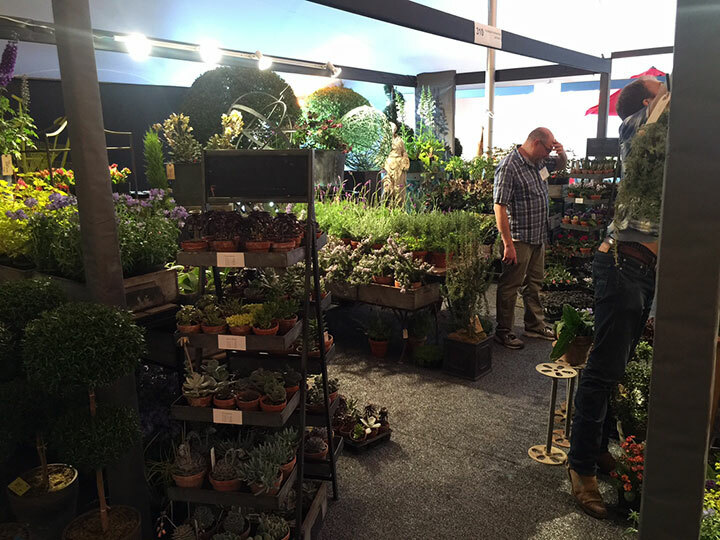 It’s a fun show you’ll be glad you attended, with a great variety of plants, garden items and antiques. 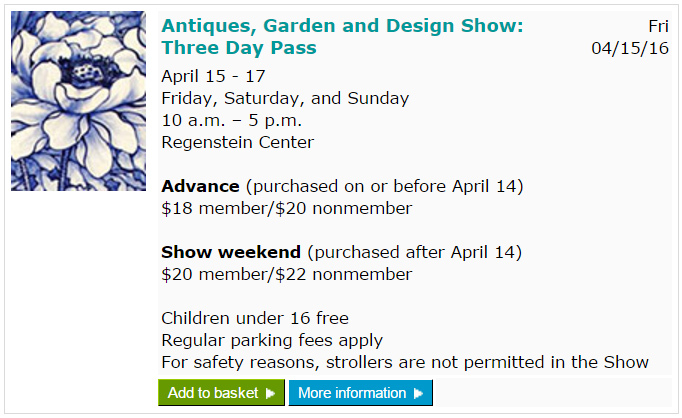 The forecast for this coming weekend is sunny, with temperatures in the 50s and 60s — perfect for a day at the show. We’re loaded for bear with some great French and American glass and lamps and many more bronzes than we usually have. 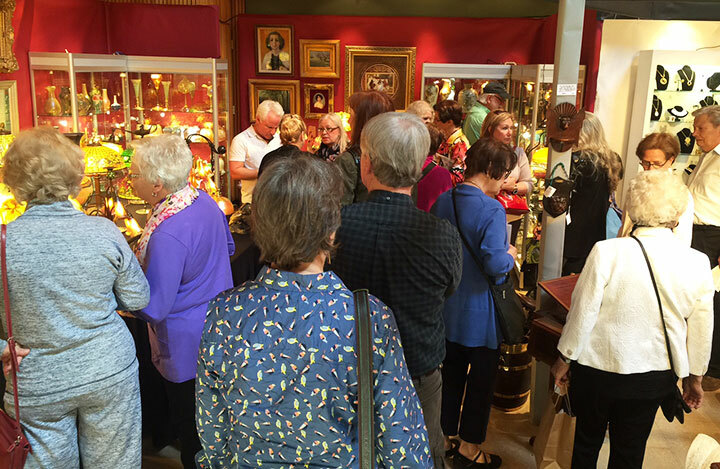 We’ll have everything for sale at the show, including Daum, Gallé and Tiffany glass; many nice Tiffany lamps, a really rare and desirable Daum lamp and lots of other items, too numerous to mention. Last year we had a fabulous show, which will be hard to top this year. Our best clients won’t be there because they’re taking a trip to Japan. Hopefully a good percentage of our many clients in the greater Chicago area will attend. After all, we’ve been exhibiting there for over 30 years. We’re in one of the permanent buildings, in a large booth, so we have plenty of room to display our fabulous inventory. If you’re in the greater Chicago area, this is one show that’s worth the trip. Please stop in, say hi, and take a look at our great items, all for sale! Make sure you tune into this Thursday’s blog, direct from the Botanic Garden. Next Monday I’ll post the results of the show. Christie’s New York held a sale of important French glass, entitled FRENCH ART GLASS: AN IMPORTANT NEW YORK PRIVATE COLLECTION, on March 23, 2016. Sales totaled $1,948,375 for the 176 lots offered. Only three lots failed to sell, for an average of $11,262 per sold lot. I expected good results because this was a really fine collection and the market in French glass is buoyant. The collection consisted of mostly pâte-de-verre items, but included some cameo glass by Gallé, Daum Nancy and Muller. 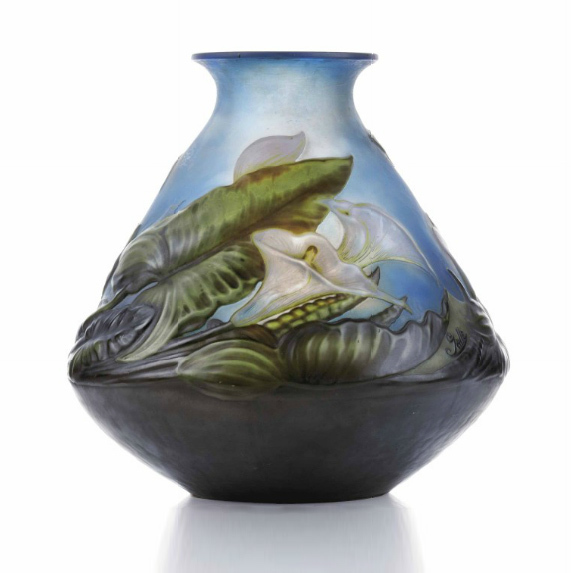 The top lot of the sale was #29, a huge Gallé blownout Calla Lily vase, in a rare color combination of white flowers and green leaves on a blue background. 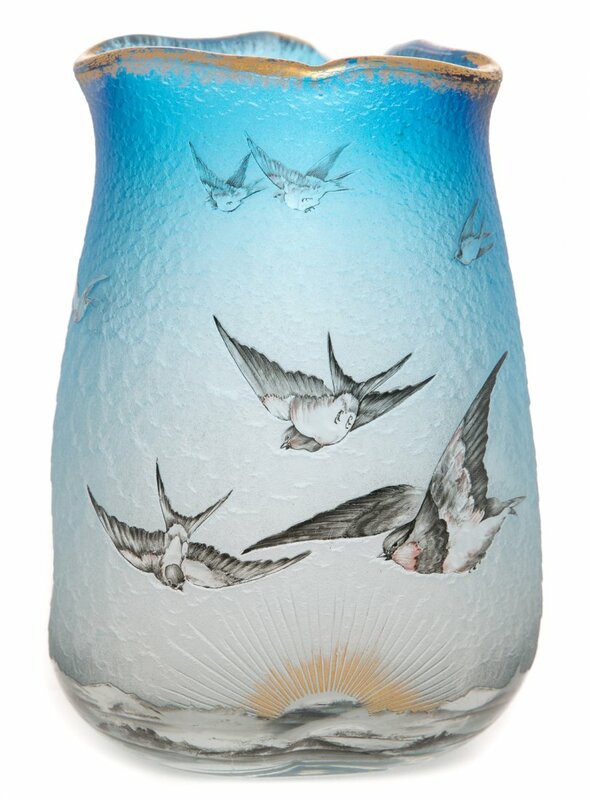 It easily exceeded its high estimate of $70,000, realizing $106,250, including buyer’s premium, even with open bubbles on the interior of the vase. 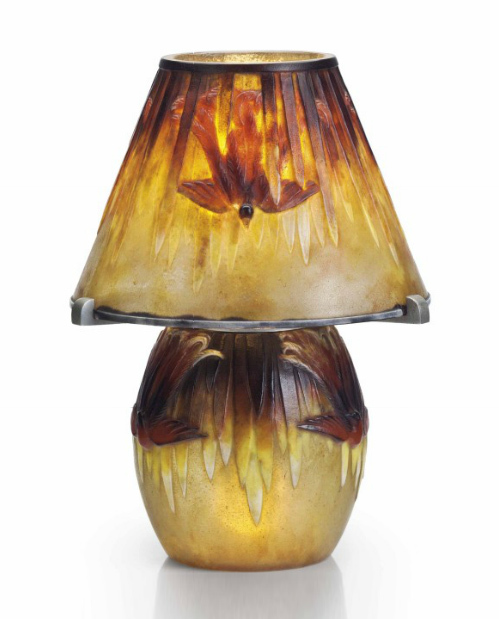 A beautiful and rare pâte-de-verre table lamp by Argy-Rousseau, lot #69, was second best. 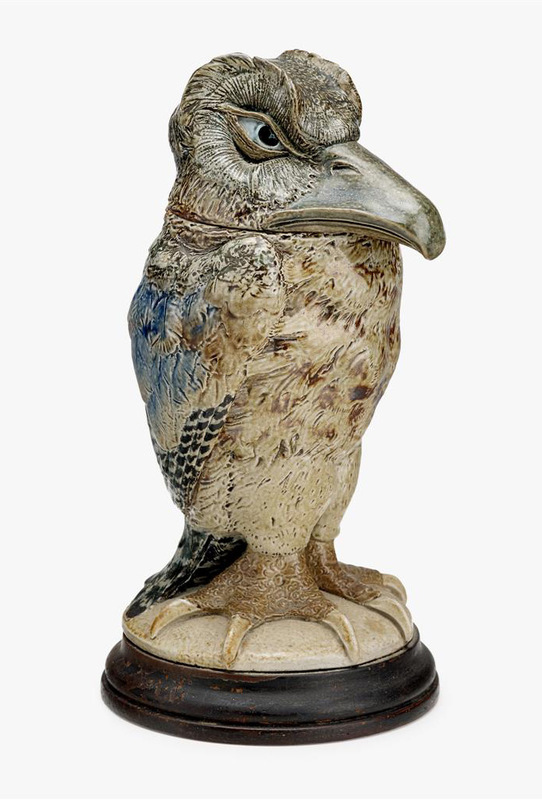 Entitled OISEAUX DE PARADIS (Bird of Paradise), circa 1928, it sold for $81,250, against a pre-sale estimate of $35,000 – $55,000. 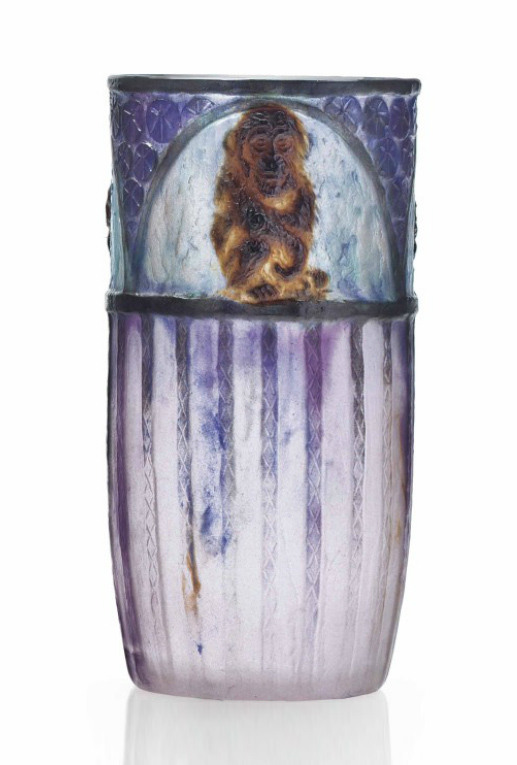 I loved lot #111, a very rare Argy-Rousseau pâte-de-verre vase entitled Singes, with monkeys, on a gorgeous blue and purple background. It sold above its high estimate of $20,000, realizing $27,500, including buyer’s premium, but I thought it would sell for even more. Can you believe our next show is next week! We’ll be in Glencoe, IL, for the Garden, Antique & Design Show, at the Chicago Botanic Garden, starting April 15th. It’s a beautiful show, with both antiques and gardening, that you’ll absolutely enjoy. We only have two remaining shows in the greater Chicago area, so come and say hi! Three Martin Brothers bird tobacco jars came up for sale at Freeman’s Art + Design auction on March 20, 2016. Two of the birds sold well, near or exceeding their high estimates. Lot #98 was the top lot of the three birds. 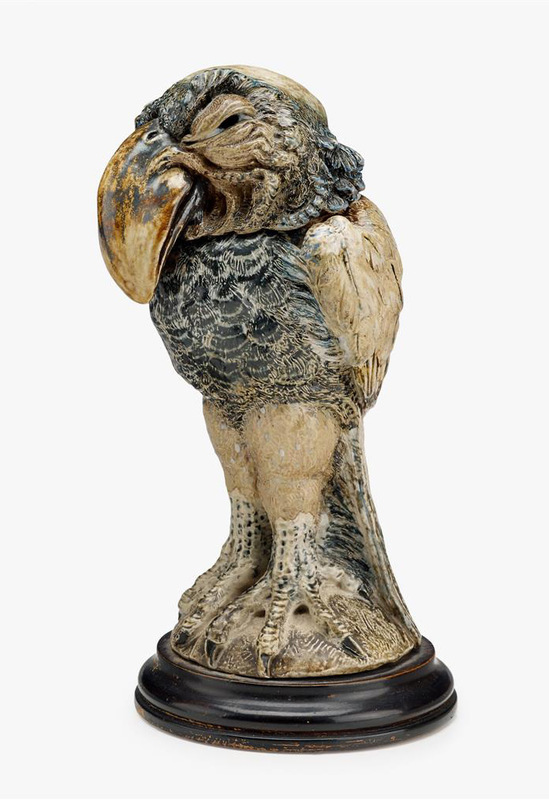 With its big beak, great personality and nice size of 11½”, it sold for $46,875, against an estimate of $20,000 – $30,000. Lot #97 also did well. It sold near its high estimate of $25,000, realizing $27,500, including buyer’s premium. It was slightly smaller than lot #98, but also had plenty of personality. Our next show is less than two weeks away. We’ll be in Glencoe, IL, for the Garden, Antique & Design Show, at the Chicago Botanic Garden, starting April 15th. It’s a beautiful show, with both antiques and gardening, that you’ll absolutely enjoy. We only have two remaining shows in the greater Chicago area, so come and say hi!